The North American and Canadian Orienteering Championships were held August 17-24th in Whitehorse, YT. The six races over seven days had OANS representation from twelve athletes. Our Orienteers faired very well at the event that saw approx 550 total participants. We had 9 athletes who had top 3 finishes, for total of 26 NS top 3 finishes! This included 3 athletes who brought home gold(s); Evie Hall won 6 gold medals (all her events), Milo Hall won 3 gold medals and Emily Secord won 2 gold medals. NS also represented in the NA Club Relay with two full relay teams. The event was very well organized and provided some incredible terrain to challenge our orienteers. Congratulations to all Nova Scotian participants on your experience and accomplishments in “Larger Than Life” Yukon. This past weekend the following members of OANS were recognized at Sport Nova Scotia’s Support4Sport Awards. These recipients are selected annually by the OANS Board of Directors at our AGM from nominations put forth by OANS members. OANS would like to congratulate this year’s recipients! Matt achieved tremendous success in the 2017 orienteering season, finishing as the top male competitor in the Nova Scotia Orienteering Series and winning the M21E in both the middle and long distance categories at the 2017 Provincial Championships. Cheryl achieved success at multiple events within the province and across the country. 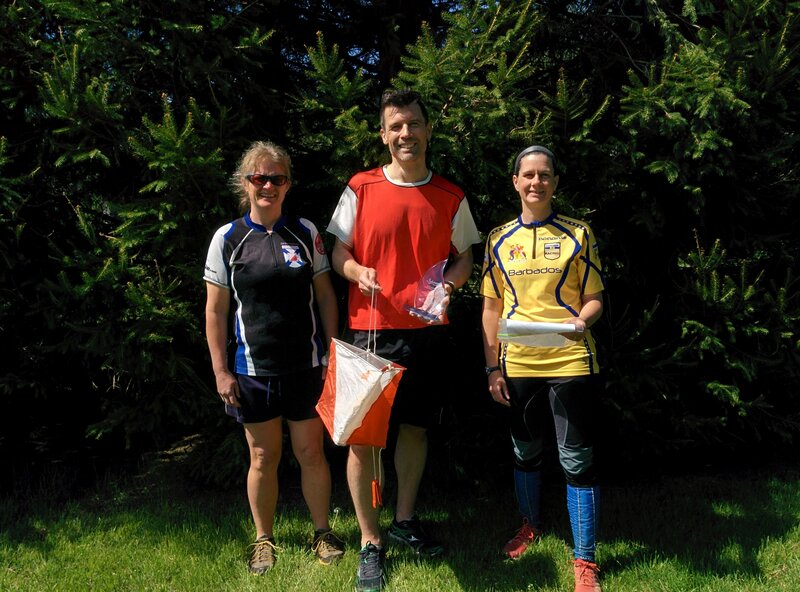 Cheryl was the co-champion of the Nova Scotia Orienteering Series and won her age group in both the middle and long distance categories at the 2017 Provincial Championships. Cheryl also won gold in her age group at both the Canada Cup Sprint and Canadian Orienteering Championships Sprint, and was the Eastern Canadian Champion in middle distance for women’s elite. Pam officiated all of the OANS Canada Cup events in 2017 which were 3 of 5 NSOS eligible meets. Pam has always been very generous with her time, acting as a mentor to other officials and controlling and planning courses. Pam is a detail-oriented course planner and controller, advocating and striving to keep provincial events in line with national technical standards. Her time and energy are valuable assets to the sport. Tony took lead on an extensive mapping project that included the hiring of a foreign mapper and arrangement of accommodations for the mapper, which gained the association 5 new, expanded or updated maps in Nova Scotia which is vital to the quality and development of the sport. The Kaill Award, while not awarded at the Support4Sport Awards, is perhaps the most prestigious to OANS. It is awarded to an individual who has demonstrated outstanding contributions to the sport of Orienteering in Nova Scotia. This year’s recipient is Kara Turner for her tremendous community outreach efforts especially in the South Shore region of Mahone Bay to Bridgewater. Kara seeks innovative ways to trigger interest in the sport, using social media and special events to advantage. She is working to form and maintain partnerships with community groups to encourage increased physical activity and introduce new participants to the sport of orienteering. Kara has also strategically sought new areas for mapping which have potential for ongoing community partnerships. A whopping 77 participants came out to Fleming Park for World Orienteering Day 2018! They ventured out on three courses and some lucky folks took home some sweet WOD headwear! It was great to share orienteering with some New faces, Cadets, Cubs, Girl Guides, some Old Timers and some Regulars! We hope to see you all again. A very big Thanks to Tony Wheeler, Meghan Woszczynski and Patricia Duncan for all their help at the event! On Sunday April 8th, 35 participants capitalized on the calm before the (snow)storm at the Shubie Shakeout Score-O! Three courses were offered and many new faces came to enjoy the event! Many thanks to the volunteers who helped with the event including Colin Davis, Tony Wheeler and Patricia Duncan. Due to a death in the family, the organizing staff has been forced to cancel the November event of the Four Seasons Chase. The following are the NSOS scores updated following the 2017 Bluenose Classic Middle & Long Distance events. These scores include the competitors’ Best 3 of 4 eligible scores (including up to one staff event). The issue in Debert has been happily resolved and therefore the long event scheduled for October 15th will proceed as expected. A heartfelt thanks goes out to the people that worked tirelessly to bring this issue to a successful end and my thoughts are with the two men that were injured during the resolution of the issue.